Language is not a barrier to BTS. 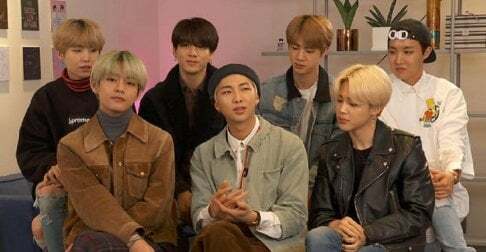 In an exclusive interview with Entertainment Weekly, the K-pop boy group, whose songs are majorly in Korean with a few English words here and there, explained why they think it's important to stick to singing in Korean. To the interviewer who mentioned "Despacito," a Spanish hit that recorded No.1 on Billboard for 16 weeks, leader RM said, "I don’t want to compare, but I think it’s even harder as an Asian group. A Hot 100 and a Grammy nomination, these are our goals. But they’re just goals — we don’t want to change our identity or our genuineness to get the number one." He continued, "Like if we sing suddenly in full English, and change all these other things, then that’s not BTS. We’ll do everything, we’ll try. But if we couldn’t get number one or number five, that’s okay. Famous DJ Steve Aoki commented, "I think it’s 100 percent possible that a song sung entirely in Korean could crack the top of the Hot 100. I firmly believe that, and I really firmly believe that BTS can be the group that can do that. It’s going to pave the way for a lot of other groups, which they’ve already been doing—and when that happens, we’re all gonna celebrate." And that's what I respect. They were criticized and some people said that they are copying American artists. They're proving that they're not going to do it. And I do respect them as artists. Despite young age (comparing to other artists on the same level of popularity) they're not getting all-and-mighty. And their songs have a meaning - mental health, self-love, etc.. Maybe it is cliche but still they do understand the responsibility and try to influence people in a good way.